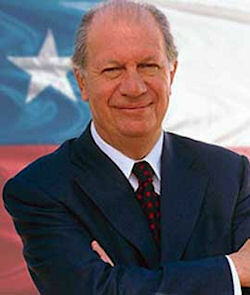 In January 2000 Ricardo Lagos Escobar was elected President of Chile after winning the second round presidential election, thus becoming the first President of Chile of the XXI century to guide Chile into the challenges of the new millenium. Lagos, 61 year old, became the country's third concertation coalition president since the end of the military rule in 1990, obtaining 51.3% of the votes. Ricardo Lagos Escobar was born in Santiago on March 2, 1938, the son of teacher Emma Escobar and Froilan Lagos, a farmer who died when his only son was eight years old. His earliest political influence came from his mother’s family, with its long tradition in the Radical Party. His aunt, Fresia Escobar, was the first woman mayor of the community of La Granja, in representation of the Radical Party, strongly rooted in the Chilean middle class. But, it was his uncle, Ernesto Escobar, a deputy for the Liberal Party, who sparked his true interest in the country’s domestic political life. His schooling took place in two distinguished public centers of education: Liceo Manuel de Salas and the Instituto Nacional. While at the Instituto, he met Patricio Aylwin Azocar, then professor of Political Economy, who later became, in 1990, the first democratic President of Chile after 17 years of military rule. There Ricardo Lagos was also elected for the first time for a representative position: President of the Academia de Letras Castellanas, where he met future writers Antonio Skarmeta and Ariel Dorfman. He studied Law at the University of Chile and was elected President of the Student Center. His dissertation, “The Concentration of Economic Power,” was approved with highest distinction, but political pressure prevented it from being published by the Editorial Juridica, as was the custom for all papers having that acclaim. However, it was finally published by Editorial del Pacifico and had great success. In 1961 he married Carmen Weber, but was separated six years later. His two older children, Ricardo and Ximena, were born during that marriage. In 1971 he married Luisa Duran, who had two children from her first marriage: Hernan and Alejandro Edding. In 1975 Francisca, their only daughter, was born. Altogether the family had five children and a number of grandchildren. As an outstanding lawyer, Ricardo Lagos attained, between 1960 and 1962, a Ph.D. in Economics at Duke University in North Carolina. Back in Chile he was employed at a tenured professor at the University of Chile, was Director of the Institute of Economics of the School of Political and Administrative Sciences, and then was elected Secretary General of the University. In 1972, he was named Secretary General of the Facultad Latinoamericana de Ciencias Sociales (FLACSO) and Director of the Consejo Latinoamericano de Ciencias Sociales, a position that he held up to 1979. In 1973, Lagos was also the representative of Chile to UNCTAD III. During 1974 and 1975, he and his family resided in the United States where he occupied the William Kennan chair in Latin American Studies at the University of North Carolina. Between 1978 and 1984 he was the chief economist of the Regional Employment Programme for Latin America and the Caribbean of the International Labor Organization (ILO) of the United Nations. During the eighties Lagos played an important role in the struggle for the recovery of democracy in his country, when, as a leader of the Socialist Party, he held the position of President of the Democratic Alliance, a coalition that united all the parties opposing the Pinochet regime. In the early morning of September 7, 1986, several hours after a frustrated attack against Pinochet, Lagos was arrested along with other figures from the Chilean dissidence. Three weeks later he was released without any charges following an intense international campaign demanding his freedom. Lagos fervently defended the idea of participating in the 1988 plebiscite to defeat Pinochet under the same rules that Pinochet himself had imposed. To this end, in 1987 he presided the Committee of the Left for Free Elections, called on the people and political parties to register en masse to vote and to overcome the fear instilled by the dictatorship. That same year he founded the Partido por la Democracia (PPD), which became the second political force within the government coalition known as the Concertacion de Partidos por la Democracia. In 1990, during the administration of Patricio Aylwin, he was named Minister of Education. In that position he instituted an educational reform that made a priority of equal opportunity in the access to education and sought to improve the quality of teaching. Based on this goal, special programs were created for the students of the 900 poorest schools in Chile, providing food, library, and educational training benefits. During that period, the Teaching Statute was also approved, which allowed teachers to obtain benefits denied to them for years. Another of his achievements was the creation of FONDART, a special fund for culture and the arts, as well as the National Book and Reading Fund to finance and promote the creation, publication, and diffusion of books. During the government of Eduardo Frei Ruiz-Tagle, in 1994, he was designated Minister of Public Works, which he held until 1998. During that time, he put forth a revolutionary system of highway concessions that allowed the construction of highways meeting high standards, with the vital participation of the private sector and allowing investments of more than 4 billion dollars in different projects. This permitted him to free up public resources in order to invest them in drinkable water systems for rural sectors and small fishing ports. Parallelly, Minister Lagos set in motion infrastructure for regional integration, by means of the opening or improvement of roads and bioceanic connections with neighboring countries of South America. Ricardo Lagos is a member of the Special Committee of the Socialist International integrated by twelve distinguished members, including Felipe Gonzalez and Gro Bruntland, in charge of the elaboration of proposals for the renovation of Social Democratic thinking for the XXI century. In September of 1999, Ricardo Lagos Escobar publicly embarked upon the road to the Presidency of the Republic as the sole candidate of the Concertacion, after winning the primaries within the coalition. During the first year of his term in office, Lagos had to confront a high level of unemployment, generated by the political instability of the region, in a process that began to revert during end of 2003. Lagos faced a new challenge to get the country out of the waste recession it has been in for more than 20 years. Lagos, in collaboration with a young US trained economic team, planned to develop liberal economic policies in hopes of returning GDP growth from 5 to 6% in year 2000 after an 1% contraction in 1999. Ricardo Lagos tried to build an economy based on knowledge and technology as well as commodities. One government initiative encourages Chileans to learn English so that the country can expand business links all over the world. In November 2005 President Ricardo Lagos proposed reparation payments for thousands of Chileans tortured by the government during the military dictatorship of Augusto Pinochet. Lagos said he would ask Congress to approve compensation for at least 28,000 victims, including a monthly pension of about 190 dollars, and health and education benefits. President Lagos said he based his decision on a new report on human rights abuses committed during General Pinochet's rule from 1973 to 1990. Chilean army officials recently said human rights abuses during that period were institutional and not only the actions of a few people. Under Ricardo Lagos, the government approved the construction of a hydroelectric dam in Mapuche areas, despite more than a decade of strenuous objections from Mapuche activists. He later issued a last minute and poorly explained cancellation to what would have been the largest ever meeting between the Mapuche community and the Chilean President, angering thousands who had travelled from across the country for the dialogue. The six years in office of Socialist president Ricardo Lagos were some of the most prosperous in Chile’s history. Most Chileans were content with the general direction in which their country was moving and have voted for continuity.